Summer may be over but surely there's room for one last ice cream fad, right? 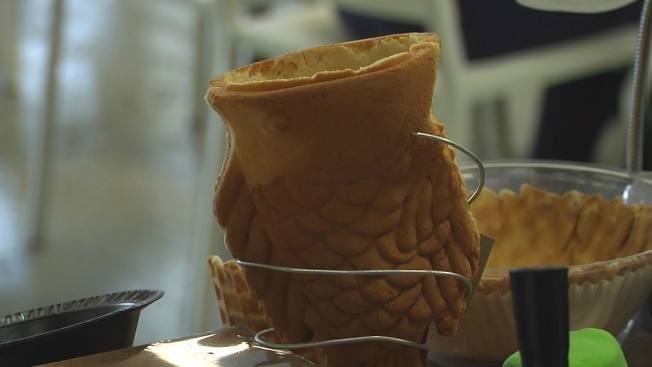 The latest craze in ice cream is "taiyaki" cones shaped like fish and made out of a kind of sweet pancake batter. Lovers of soft-serve eat from the cone fish's mouth. Most afternoons, Uji Time Desserts in Berkeley has a line out the door of customers waiting for one of these cute cones and the soft-serve ice cream with traditional Japanese flavors. The fish cones were so popular for the shop's first couple of months that customers had to make reservations, said owner Benson Leung. Leung said he and his partner wanted to serve traditional Japanese and Asian desserts and bought the taiyaki machine online on a whim. But the fish cones quickly caught on and they couldn't make enough to meet demand. "We wondered why it hadn't caught on here, why no one was serving them," he said. "After we started doing it we realized it's a lot of work to get this to work. Get the batter right, the temperature right, the machine to work." Now Leung and his staff have it down to a science, and anyone with enough patience can get a fish cone. Meanwhile word has spread and the lines wait patiently for mochi ice cream and fish cones stuffed with black sesame, lychee, matcha green tea flavored soft-serve. Tofu soft-serve is the specialty at Uji Time. There are also seasonal flavors like lavender. Each fish cone comes with a generous dab of sweet "azuki" bean paste inside too. On a recent afternoon, the shop was full of families and Cal students from Asia homesick for traditional desserts.